Dr. Fred Caldwell performs a dental scope examination on a horse. 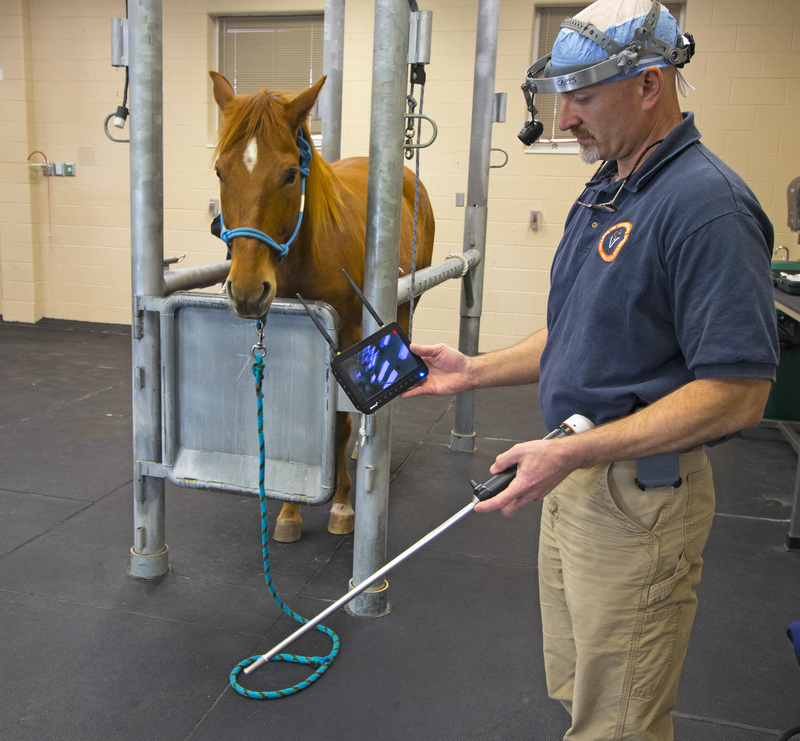 A newly acquired equine dental endoscope by Auburn’s College of Veterinary Medicine is improving the examination and treatment of dental abnormalities in horses while also enhancing the education and skills needed by veterinary medical students. Horses have long, narrow oral cavities, and that, coupled with having to be partially sedated beforehand, makes conducting a thorough equine dental examination or procedure relatively challenging for the veterinarian. 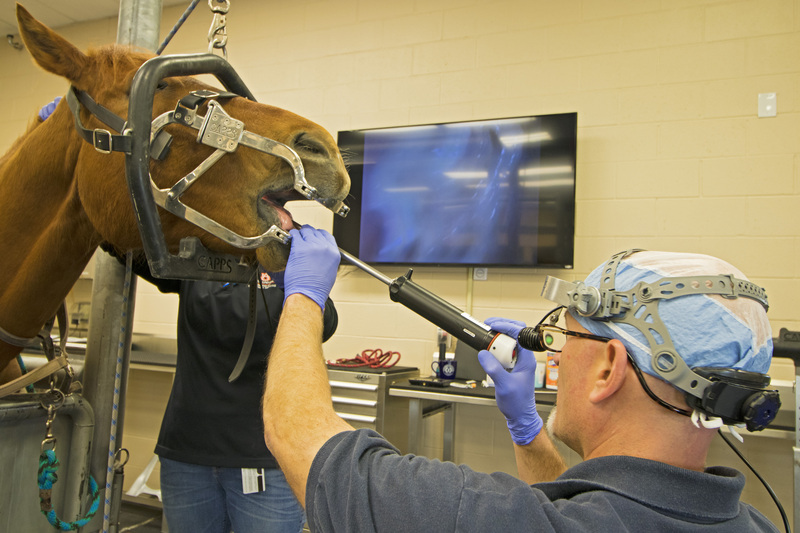 Traditional equine dental examinations involve the use of a bright lamp mounted on the veterinarian’s head and a large mirror, Dr. Caldwell explains. The process is much like a dentist conducting a human dental examination, only a horse has to be partially sedated and its mouth held open by a large instrument called a dental speculum. Unlike the flexible equipment used for internal endoscopy examinations such as the interior of the stomach and esophagus, the dental scope is a rigid shaft instrument much like a laparoscope. It is better adapted for the horse’s mouth and, coupled to a halogen light and a chip camera, enables detailed visualization of the oral cavity and teeth and better detection of dental as well as other problems or potential problems in the horse’s mouth. While this is not new technology, it is not widely used among veterinary practices, according to Dr. Caldwell. The equipment is Bluetooth equipped, can produce still or video photography, and it enables real-time viewing of the patient’s examination via a video monitor or even a smart phone. Dr. Caldwell added that the dental endoscope seems to be better tolerated by the horse in most cases than the manual traditional examination techniques, allowing a more rapid completion of the examination or procedure. The equipment was purchased with funds secured through a technology teaching grant. Veterinary students have access to its use as a regular part of their education and training. It is an example of Auburn faculty delivering life-changing care and treatment while providing students an extraordinary, hands-on educational experience. Learn more about the Equine and Sports Medicine Service.